How do you find quality talent on social media? How do you keep your team members happy and engaged? How can social marketing campaigns answer these questions? 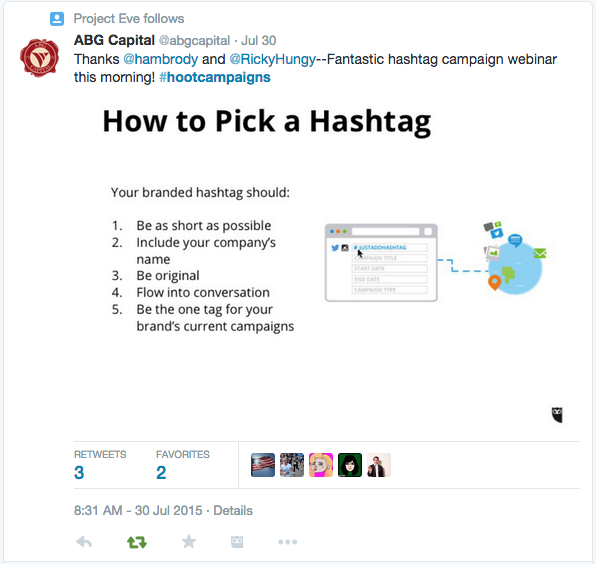 Discover the answers to these questions and more in our recent webinar, 3 Hashtag Campaigns That Went Viral (and How We Did It). Hosted by Richard Hungerford, the Director of Hootsuite Campaigns and Hootsuite’s VP of Talent, Ambrosia Vertesi, this dynamic duo shared insider secrets to designing and launching successful social media campaigns. Learn how to design a hashtag to cut through the noise and reach your fans, and how Hootsuite uses social marketing campaigns to attract and keep top-calibre talent. From an insider’s perspective on Connect via Hootsuite New York to #Hootsuitelife, Hootsuite’s team-driven engagement UGC campaign, learn how your business can use social campaigns to stand apart from your competition. Watch the latest webinar from Hootsuite Campaigns to see how to reach and motivate your fans on social. Richard Hungerford, the Director of Hootsuite Campaigns, witnessed his creation in action at Connect via Hootsuite New York, 2014’s exclusive networking event for the Big Apple’s best and brightest, and told viewers how they can use social marketing campaigns to deepen event engagement. Ambrosia Vertesi, the VP of Talent at Hootsuite, spearheaded the growth of Hootsuite from 20 people to nearly 1,000 employees. #Hoothire, launched in tandem with Hootsuite’s hiring fair, won the company hundreds of entries on Twitter and Instagram, made the company trend across Canada and won Hootsuite dozens of pieces of press coverage. #Hootsuitelife inspires the Hootsuite team to share the adventure with the world; learn how the campaign has inspired our Owls to post nearly 5,000 photos so far. How your talent team can use social marketing campaigns to attract new talent and keep your current team happy and engaged.